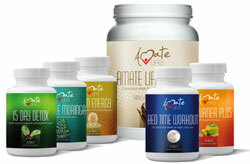 Amate Life operate in the health and wellness MLM niche and operate out of the US state of Maryland. On the management side of things, Amate Life is headed up by CEO and co-founder, Kester Albo. Prior to Amate Life I wasn’t able to find any information linking Albo the MLM industry. Back in October 2011 Albo (below right) filed a trademark for the name “Amate Life”, which was granted in June 2012. Meanwhile on her LinkedIn profile, Kester Albo’s wife, Mileddi Albo (Amate Life’s other co-founder and President), lists involvement with Amate Life dating back to February 2011. The lack of information available on the Albos in relation to the MLM industry would indicate that Amate Life is their first venture on the executive side of things. Read on for a full review of the Amate Life MLM business opportunity. Amate Life’s products are made with high quality natural ingredients that help you burn fat, lose weight, detoxify and nourish your body. The Amate Life compensation plan is focused on product volume, paying out affiliates a series of upfront bonuses, residual commissions via a unilevel and the chance to qualify for shares in volume-based bonus pools. In order to qualify for commissions an Amate Life affiliate must either have a monthly $99 autoship order or generate $200 BV in retail or personal volume (PV, self consumption) each month. When calculating BV, Amate Life state that ‘the BV and Distributor Price are identical for most products‘. The distributor price is a 25% discount so when ascertaining a product’s BV, take it as 25% of the retail prices quoted above (“for most products”). Retail commissions are offered on all Amate Life products (including 15% discounted preferred customer orders), with the company paying out 25% of the BV generated in an affiliate’s first month. Note that the Fast Start Bonus are stackable, meaning that if the Director rank is achieved an affiliate is paid $200. Amate Life pay out a Welcome Bonus when a new affiliate joins and purchases one of their “Welcome Packages”. Each Welcome Package offers the affiliate Amate Life products in a bundle discount and pays the recruiter a flat-rate percentage commission on the sale. A 5% bonus is also paid two levels in the upline (the recruiter’s recruiter and the affiliate who recruited the recruiter’s recruiter). Note that no BV (used to calculate residual commissions) is generated on the sale of Welcome Packages. If any of these level 1 affiliate go on to recruit new affiliates of their own, they are then placed on level 2 of the original affiliate’s unilevel team. If any level 2 affiliates recruit new affiliates they are placed on level 3 and so on and so forth down a theoretical infinite number of levels. An additional 5% is offered on volume generated by personal recruits and 2% on their first level recruits. Amate Life affiliates are optionally able to place newly recruited affiliates anywhere within their unilevel, with the additional bonus paying out regardless of where a personally recruited affiliate might be placed. Amate Life’s Executive affiliates are able to expand their unilevel commissions down each leg past the six levels initially offered. This is unlocked via the Executive Group Bonus, which all Executive or higher ranked affiliates qualify for. The Executive Group Bonus pays out an additional 2% on every unilevel leg from the seventh level onwards. The Executive Group Bonus pays out on all volume in the leg past the seventh level until another Executive ranked affiliate is found. If no Executive exists in a particular leg past the seventh level, the Bonus pays out the 2% down to the end of the unilevel leg (infinite levels). The Director Generation Bonus pays out an additional 1% bonus on volume produced by an affiliate’s unilevel team. This 1% is paid out over “generations”, with a generation defined within a unilevel leg as all the affiliate’s between Director ranked affiliates (the first generation is defined between the affiliate at the top of the unilevel and the first ranked Director affiliate in any given leg). The Executive Generational Bonus builds on the Director Generational Bonus, offering up an additional 2% on the volume on unilevel legs that are Executive ranked or higher (the recruited affiliate at the top of the leg is ranked Executive or higher). Note that as with the Director Generational Bonus, all unilevel legs are qualified independently of each other. The Executive Check Match Bonus is an additional volume bonus, paid out on the volume generated by fourth and fifth level Executive or higher ranked affiliates in any individual unilevel leg. The Producer Bonus ‘consists of 2% of the total company volume‘ and is paid out weekly via a bonus pool. Shares are earnt by affiliates for each 300 PV they generate either on retail autoship orders or Welcome Packages sold to new affiliates. Each 300 PV generated equates to one share in the Producer Bonus for that week. Note that Producer Bonus volume is calculated over a rolling 4 week period company-wide, with any qualifying PV generated over that period used to allocate shares each week. Any additional PV (once 300, 600 or more PV) has been taken out one week can be rolled over the next week so long as it is within the rolling 4 week Producer Bonus volume period. Once the 4 weeks is up, an affiliate’s qualifying PV flushes and volume is counted from scratch for another 4 weeks. The Leadership Bonus Pools are two pools made up of ‘2% of the total company volume’ (1% in each pool). Note that an Executive or higher ranked affiliate maintains their three shares in the Director Pool. Amate Life offer Junior Area Director or higher ranked affiliates a monthly Car Bonus. Junior Area Director’s qualify for a $300 a month bonus and Area Director or higher ranked affiliates qualify for $600 a month. Affiliate membership to Amate Life is $29.95 a year. Amate Life has a solid retail offering which is backed by what appears to be an equally solid compensation plan. Typically commission qualification ignores retail but, and this is rare in the MLM industry, Amate Life offer a purely retail alternative volume wise which is great to see. The volume-based performance ratios on retail commissions was also a nice touch, pushing affiliate’s to sell more volume at a retail level to increase their overall retail commission percentage. This wholly encourages affiliate’s to focus on the retail side of their business, which their definitely going to need in the long-run if they plan on working the Amate Life compensation plan. On the surface the Welcome Package Bonus did look a bit iffy but it’s a one-time upfront commission that does not pay residually. Given the amounts paid out I see the bonus as complimentary to the rest of the compensation plan rather than a core focus. In fact focusing on the Welcome Package bonus makes little sense as, due to the nature of the commission, will lead to recruitment exhaustion quite quickly. Furthermore the upline commissions are only 5%, so there’s not going to be any upline pressure over the bonus either. The Producer Bonus was also a bit iffy at first glance, but it’s paid out on company-wide volume, not just that of Welcome Packages. Tying in to the futility of focusing on selling Welcome Packages (purely from a time vs. effort viewpoint), when compared to focusing on retail and the organic building of an Amate Life business, focusing on Producer Bonus shares isn’t worth the ongoing commitment to generate shares. Instead it’s a nice complimentary balanced bonus that rewards affiliates when Welcome Package volume is generated. Retail will be key here for long-term success volume-wise within the Amate Life opportunity, so definitely check with a potential upline as to what their retail volume vs. recruited affiliate volume is. And it’d definitely be a bonus if an affiliate is active via retail volume. That said I’ve got nothing against the autoship qualification, as it gives an affiliate a chance to try the products and market them (due to the nature of the product line having some on hand will definitely help). That said, as with any marketing efforts, if the autoship is to be used as a marketing tool the results of the effort will have to be kept track of. Last thing you want is a monthly product order you don’t know what to do with. In conclusion, try out some of Amate Global’s products and then explore your potential upline’s downline genealogy to get a feel for what your own Amate Life business will look like once you start building it. If you like what you see, good luck! In fact focusing on the Welcome Package bonus makes little sense as, due to the nature of the commission, will lead to recruitment exhaustion quite quickly. So, residually, I will only be paid 5% from level 1 to the 6th level, and anything beyond the 6th level is flushed/ kept by the company or rolled up to my upline? Not counting bonuses, How many active affiliates would have to be in my downline for me to earn, let’s say, $2000 to $5000 per month in residual commissions alone? As quoted, focusing on the welcome Pack Bonuses could eventually lead to recruitment burnout. Amate Life happens to be located in California, Maryland as opposed to the state of California. The seventh level onwards is paid out via the Executive Group Bonus. It does stop when another Executive is found past the seventh level and in that instance yes, the volume generated is not directly paid out on (although percentages of it are paid out elsewhere in the comp plan via the bonus pools). I think by the time someone has an Executive ranked affiliate below the seventh level they’re going to be looking at a pretty large downline and healthy commissions (remember each unilevel position has its own retail volume downline attached to it). Too many variables, retail volume, affiliate team volume and then their retail volume (different percentages). Some affiliate sales don’t generate residual BV etc. I think it’s better you pick what you’re going to focus on (or a ratio combination) and then calculate it. All BV percentages are included in the compensation plan material so apart from a bit of stuffing around on the maths side, shouldn’t be too hard to work out. I hate math so I’m not gunna bother :). Thanks for the correction, I did see MD pop up in some addresses linked to the company but thought it might be an old address (my US state geography is always improving :)). Thanks for Your input and clarification, Oz. Although the unilevel plan may be one of the easier ones to comprehend, there are some plans which require a math wizard to decipher. I, myself, am not very keen on math.